It's time to give the new deep line tool and Lindsay Artisan a test drive. I sharpened the tool using both red templates so I would have a heel, did a little test cutting with hammer and chisel to make sure the tool was cutting correctly, then put the tool in the artisan, I wanted to see what the cutting range of this tool was. From digging out the background to the light shading it didn't miss a beat. It took a little getting use to because I usualy use a push tool for the medium to fine lines which takes some force but with the artisan I had to learn to guide it (big difference). The first picture shows the main cutting almost complete. The second picture has a lot of glare but I wanted to show that some background had been removed. PS. I will be posting how to use other templates and how the tools work. Thanks for showing that Carl! I love the depth of that design. I appreciate the info on how the templates work. I'll need to add some more to my collection. When you say deep cutting, do you mean for background and sculpting, or do you mean deep narrow lines for banknote type engraving? I use my Artisan probably more than my Classic on guns. Attached is a picture of a SS Ruger I did. Most of the engraving was done with the Artisan. I may have shaded with the Classic. The loading gate was a real bear to do. Carl your work is inspiring! Ive ordered your template set and cant wait to try out your tools. Carl, nice relief engraving, that's what I'm trying to get but it's slow going. Beutiful scrolls, nice and clean cuts, nice! Did you anneal the loading gate? I have found that those SS Ruger gates are almost unengraveable even after annealing. Also that is a beautiful job on the Vaquero. How long did it take you to complete it? Very nice work Carl. Very nice. Hi Carl I was introduced to your work on the cover of issue 81 of "The Engraver". The 'how he did it' article and photos are great. I hope you make that casting available to FEGA members. Your carving looks so very deep; the casting will let us see the actual physical depth. The article is very well written. Everyone should become a FEGA member if only to get the subscription to "The Engraver"; always great reading. Would you share with us the angles of those four tools? Thanks for taking the time to share your creativity. Carl I'd like to add to my previous post. Your method of sharpening gravers, perhaps other tools also, is very imaginative. I come from a different backround. I'm a total novice in engraving, but I love everything about engraving. You, Phil Coogan, Steve Lindsay and some others are inspiring and no doubt will continue to inspire a hundred years from now. I have a book in my library "Heroic Armor from the Italian Renaissance". [I hope publications of this sort continue in the age of computers] The work illustrated in this book is of the highest quality metalwork and you guys are a continuation of this tradition. My ambitions vis-a-vis engraving do not include guns (no political position here); but I love work of such high excellence. Daniel H is more in the arc of work I'd like to pursue. To return to gravers and sharpening: I've been and still am a lapidary/goldsmith some 30 years on. I use a Raytech faceting machine. I have a second Raytech that I use for graver sharpening. It's different than most in that it has a handpiece that holds the dop, which holds the stone which can be lifted off an elevating platform for inspection. I'm adapting the quill in the handpiece to hold a graver. As do you, I like adapting things to new uses. Our best tools are those we make ourselves. I hope to adapt what you do in guns to more personal interests. When I saw the cover of "The Engraver", I thought this is groundbreaking design/work. Finally, the Raytech is why I'm interested in the tool angles. Carl, that is absolutely beautiful! I have that same question, whats the difference in the banknote darker line tool and the deep cut tool? Could you please explain a little bit? Great work again. Thank all of you for your replies and emails. Ill try and answer some of your questions. Most often I draw on the metal after applying my white, only on complicated jobs do I draw first then transfer. In the picture it can be seen where I scribble for general layout then I will refine it with a darker pencile, after cutting the main lines I might want to check my shading or rearrange it and again use my pencile to draw it in or erase it. Usualy the outline is cut first then background removed, last shading. All of the engraving was done with the deep line tool none of it was small enough to need a banknote tool, all sharpening was done useing the (red) deepline & banknote templates, some have asked me for the angles on the tool, the only one I can say is the V is 50 degrees with 45 heel, years ago I bought an adjustable tool sharpener but it was to much time and trouble to use, I went back to doing it by eye so I cann't say where the dials were set when I made the tool for Steve, I sent it and he make the templates. I must say the templates are much faster than doing it by eye and more accurate. As for the tool itself, a narrow tool will give a darker line than a wide tool because for the same width of cut the narrow tool will be deeper and reflect less light, that's the short answer because when teaching I can take hours to show the different techniques of dark line and banknote, I would wear out my keyboard trying to teach it here plus I don't have a blackboard and we cann't look over each others shoulders while working. The deepline tool is also used when I am going to do relief or deep sculpted cutting, a wide cutter can get in the way and nick areas you cann't see while cutting also in tight areas you will need a narrow tool to remove metal. If your main lines meat at 70 degrees and you try and remove that background with a 106 degree tool you can not get any depth or you will have a wreck trying. P.S. The deepline tool could be useful for newer engravers when cutting outlines as it is less prone to making thick to thin wavey lines due to lack of depth control. Thanks Carl! Very clear to me. Your art work is where I envy you. I can cut most anything but the overlay and intertwining of leaves is coming slow. I keep working at it drawing, drawing drawing but it still comes slow. Any ideas to speed the process? One suggestion is to forget about the leaves for a while, and just try to draw interweaving curves without any detail. Once you get a peasing effect that way, you can safely add detail, and make it work. If you worry about the leaves from the start, you may lose the overall sense of the design flow, which is much more important than the details. A good framework makes the details largeely a piece of cake! hey carl , how well would this point hold up to hammer and chisel. --- Thomas Jefferson to George Washington, 1796. Hey Carl, beutifull work. Do I understand correctly that you used this point to remove the background also? Or does it just cut a deeper outline, thus making it esier to attain such depth in the background? Thanks for your willingness to share. That is really nice work - pleasing to the eye. I was able to see the background depth. Are you going to "relieve" some of the overlapping scrolls also - to make them 3 dimensional (in real life - not just shading)? I've only just seen the photo's you posted, fantastic job. The depth you have cut there looks incredible & such clean lines. A really good design too. A very nice job. Thanks for noticing my posts. All of my template tools are designed to work with hammer and chisel or power(see pictures below), I have tested them in both modes and found them comfortable to use with the least ammount of sharpening. The narrow V is capable of many tasks one of which is removing background in areas to tight for a flat, it may take multiple passes but sometimes that is the only way. The work you see on the shotgun frame is my type of simpler floral scroll with medium relief background, if it were to be sculpted I wouldn't have put in the shading lines, instead I would have started hogging out metal to get the shaping started. Carl, gotta tell you that your scroll is beautiful either sculpted or shaded. I think it is one of the few styles that I have seen that can be done either way with great effect. The deep background removal really sets it off and it just wouldn't be right without it. I very much enjoy seeing the deep removal of background. IMO, attention to background is just as important as the positive space. 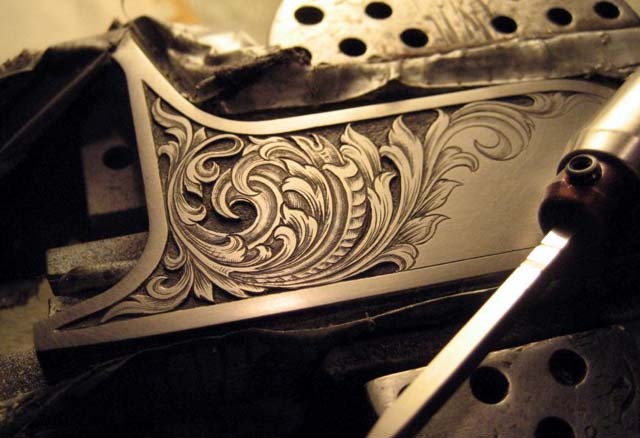 It creates dimension and is an important component of high end engraving. btw .... that's a very nice Rolex. All I can say is - I'm envious of such great workmanship. Just wonderful work Carl. I'm wondering, what is the depth of relief (in .000). I've heeded Steve's comments regarding the Artisan's " third gear" speed. However the example of what you can do with it encourages me to purchase one.I did hope to convert up to a palm control later (finances dictating), again taking Steve's advice on getting a Classic.Still would you definately say that this basic kit would enable me to tacle most jobs on guns. just a short thankyou from an old timer. You are never to old to learn something new. I know that the Classic is the best choice but until i can afford a palm control etc;would i be seriously disadvantaged if i used the Artisan forgun work. I will try to answer since I don't think my brother is participating in forums for the time being. 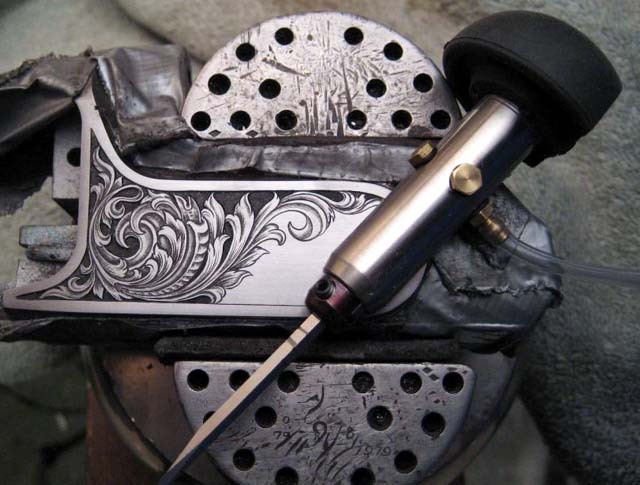 First it is difficult to answer your question because you have not told us anything about your level of training and experience at hand engraving. Also you haven't said if you want the tool for stone setting, gun engraving or a whole list of other specialties. If you are highly experienced with burin or H&C and looked to do advanced work straight away I would say you need to get the Classic or PC. If however you are a beginner, there is nothing you will be doing for a long time that can't be done with the Artisan. Consider that many of today's top engraver's first power tools were the GraverMeister or MagnaGraver. Some splendid work was done with those tools and neither of them match up to the Artisan. If I had an Artisan in the 1970's I would have thought I had gone to heaven. I probably haven't answered your question completely but you will have to give a little (information) to get any more.